Preheat over to 375. Cook macaroni as package directs; drain. Meanwhile, melt butter in medium saucepan. Remove from heat. Stir in flour, salt, and pepper until smooth. Gradually stir in milk. Bring to a boil, stirring. Reduce heat and simmer mixture 1 minute. Remove from heat. Stir in 1-1/2 cups cheese and macaroni. 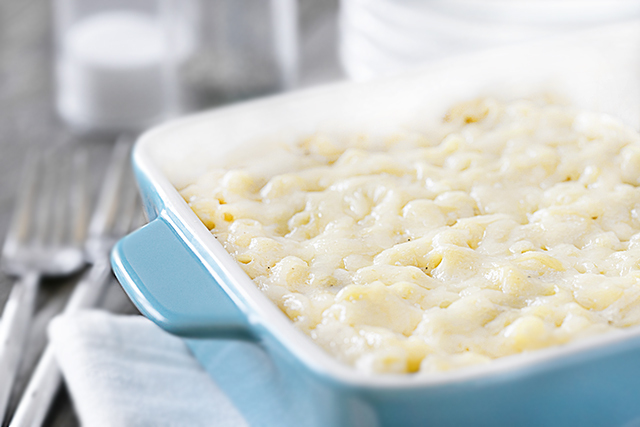 Pour into a 1-1/2 quart, shallow casserole dish. Sprinkle remaining cheese over top. Bake 15 minutes or until cheese is golden brown.